I read some history way back about the possibility that Louis XIV might have been persuaded to invade Egypt instead of fighting fellow Europeans. Obviously it didn't happen but it might have been a strategic masterstroke for the French if it had. (English power held in check by the Dutch and France has control of a crucial trade route to the East...) Anyway, a good enough reason to base a Donnybrook game in Egypt. 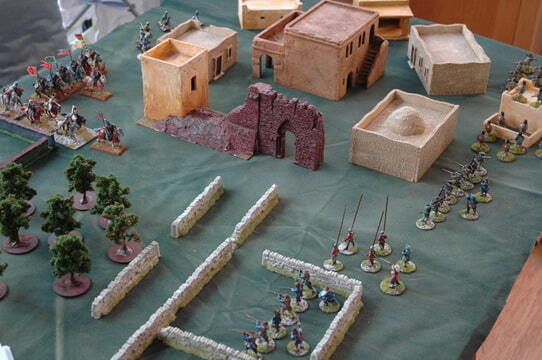 Next time I think I will have to use my ruined temple playset and a bit of the Nile to get some Dhows in on the action!